Tin glazed earthenware describes the method of decorating fine quality pottery using a technique first developed in Baghdad in the 9th century. 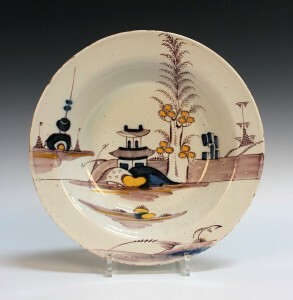 In an attempt to rival the glossy whiteness of Chinese porcelain the earthenware was covered with an opaque white glaze. The technique entered Europe through Spain which was under the rule of the Umayyad Muslim caliphate. Tin glazed earthenware arrived in Italy from Spain in the first half of the 13th century. From Italy the method spread throughout Europe. The technique remained relatively unchanged into the 18th century. After the pottery has been fired it emerges from the kiln as a brownish earthenware. It is then dipped in a glaze made up of oxides of lead and tin combined with silicate of potash. This porous white coat can then be decorated with various metallic oxides, capable of withstanding the high-temperatures of the kiln needed to unite them with the tin glaze and fuse it to the surface of the clay. Blue comes from cobalt, green from copper, purple from manganese, yellow from antimony and orange from iron. The colours are absorbed into the glaze as soon as they are applied. No corrections to the painted design is possible. Many art historians liken the process to that of fresco wall painting, rare Saxon examples of which are to be found in a number of Sussex churches. Once decorated the vessel is then given a second firing. This fixes the glaze to the object’s body and melts it to a glossy surface. Lead glaze is commonly applied before firing to enhance the finish. 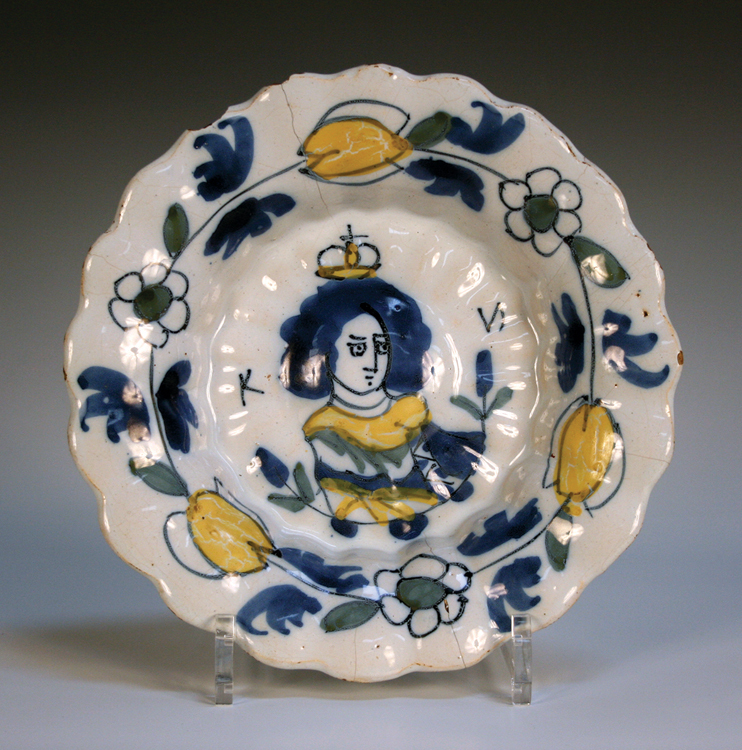 Tin glazed earthenware is often known as delft. The name derives from the Dutch town of Delft which by the mid-17th century had become the most important centre for the manufacture of tin glazed earthenware. 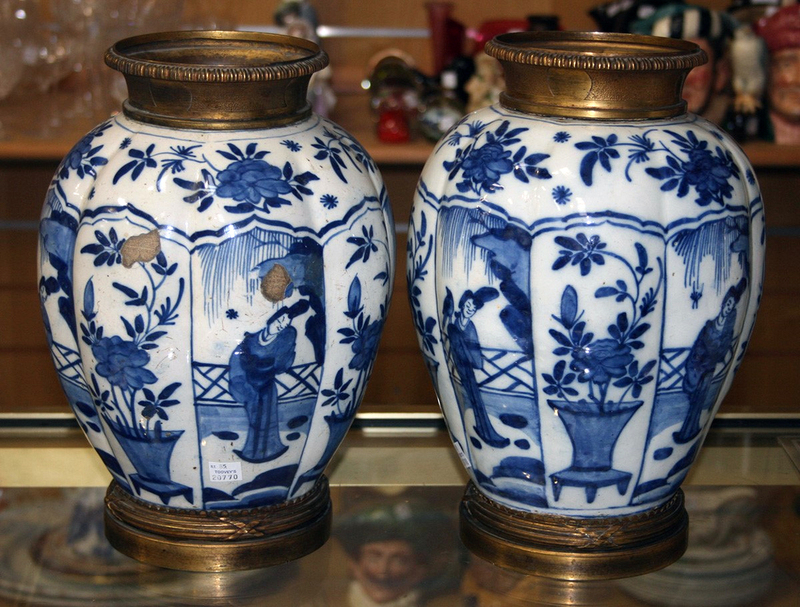 The pair of Dutch Delft vases shown here are decorated with figures in the style of Chinese vases from the 17th century Kangxi period. Many of my favourite examples of tin glazed delft are those from the 18th century made in the British Isles. 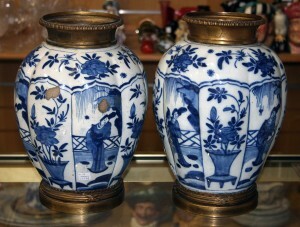 Like the Dutch vases they are frequently stylistically influenced by the Chinese imported porcelain of the same date. 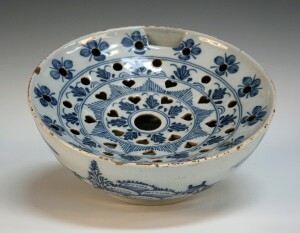 The English delft circular bowl, circa 1750, employs the manganese purple, cobalt blue and antimony yellow so typical of high temperature glazes in its depiction of a Chinese pavilion beneath a tree. The restraint and composition of the scene is captivating. 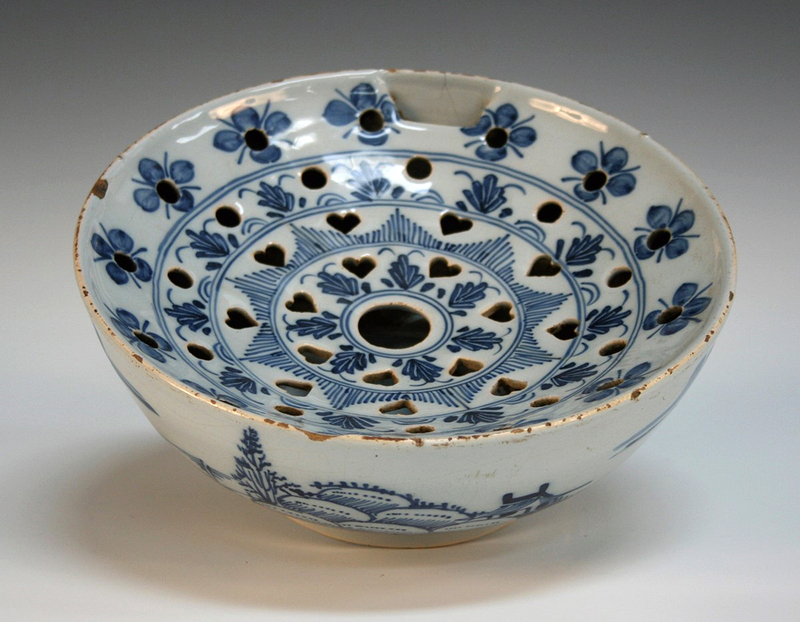 The English delft colander bowl’s exterior is painted with cobalt blue Chinese landscapes. The bands of pierced heart shaped drain holes delight with the flowing foliate decoration. You can see the pouring hole on the inner rim. It is at once beautiful and useful. There were centres of delft manufacture in Bristol, Liverpool, London, and across the British Isles. 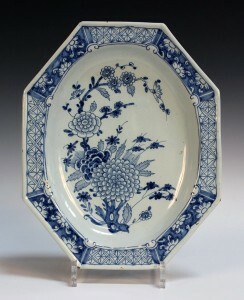 The octagonal dish illustrated was probably made in Dublin in the mid-18th century. The chrysanthemum, trellis and flower panels once again show the influence of the Chinese and are beautifully conceived. I love delft flower bricks. 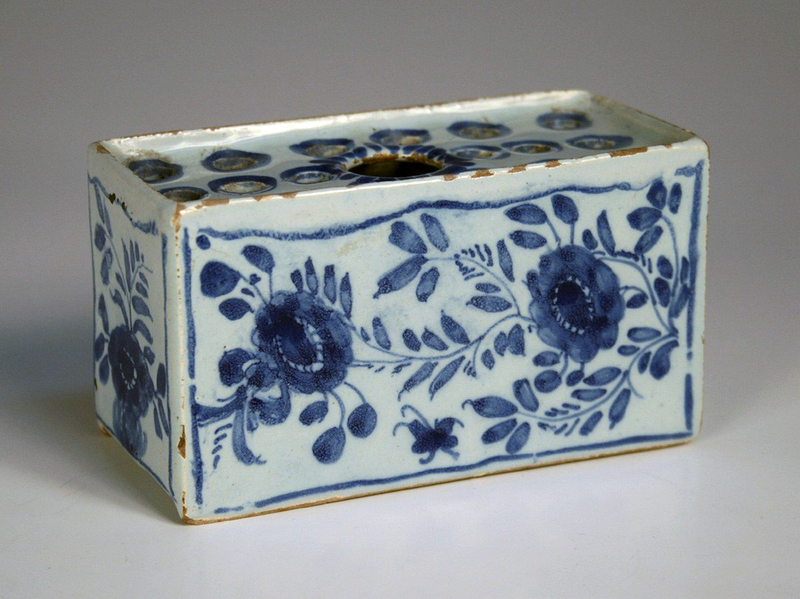 The faces of the rectangular form of this example from the 1750s are delicately painted with flowers. They are confident little objects designed to hold cut flowers. The finest examples of delft tin glazed earthenware realise tens of thousands of pounds but examples like these can still be bought at auction from between £300 and £1000. They have a delightful provincial quality. Whilst their decoration often reflects the regions in which they were made they connect the collector with the international stylistic influences of their time. Their prices are beginning to rise once again. Perhaps it is time you discovered the delights of collecting tin glazed earthenware! By Revd. Rupert Toovey. Originally published on 4th March 2015 in the West Sussex Gazette. Against the backdrop of revolution and religious conflict, 17th century England witnessed remarkable achievements in science, art and commerce. Among these were the scientific genius of Sir Isaac Newton, Samuel Pepys’ groundbreaking work with the Royal Navy, the architecture of Inigo Jones and Sir Christopher Wren, and the publication of the King James’ Bible in 1611, often described as the finest work ever produced by committee. At the end of the 17th century, Charles II’s Catholic brother, James II, was replaced by the Protestants William and Mary during the Glorious Revolution of 1688. William of Orange and his wife Mary, James II’s son-in-law and daughter, invaded England with a Dutch army. Their actions had been encouraged by a group of Tory and Whig parliamentarians, who were fearful that the birth of James II’s son would establish a Roman Catholic dynasty in the British Isles. By Convention of Parliament, William and Mary were invited to sign the Bill of Rights of 1689, which passed the crowns of England, Scotland and Ireland to them. They ruled jointly as William III and Mary II until Mary’s death in 1694. William continued his reign alone until he died in 1702. The bill limited the power of the crown, set out the rights of Parliament with rules for freedom of speech, including the right of Parliament to petition the monarch without fear of retribution, and the requirement for regular elections. William brought with him Dutch artisans, who were joined by French Huguenot refugee craftsmen. The royal couple were painted by the finest artists of their age. 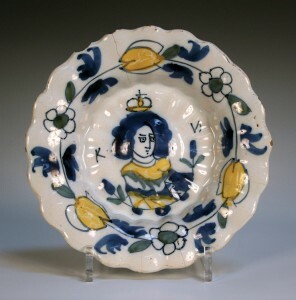 However, you cannot help but delight in the naïve quality of the depiction of William III on this late 17th century Dutch Delft dish, painted in blue, green, yellow and black. The border of tulips and other flowers shows the Dutch influence. The fashion for smaller more intimate rooms created demand for furniture of a more modest scale with an emphasis on comfort, in contrast to the opulence of Charles II’s Restoration period. There is a reliance on good proportion and simple lines in the finest examples of William and Mary case furniture, which is often finely decorated with marquetry inlay. Flowers, acanthus leaf and C-scrolls define the William and Mary taste. 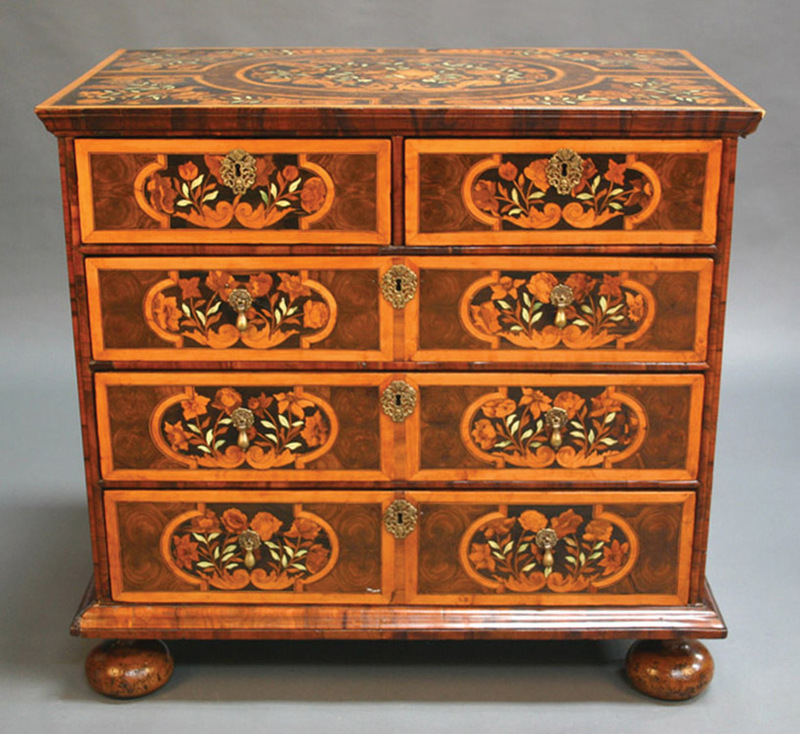 Take the William and Mary marquetry-veneered chest of drawers illustrated here. The top is finely inlaid. The central oval panel and four corner panels are filled with flower-charged vases, inhabited by birds, within a laburnum oyster-veneered border. 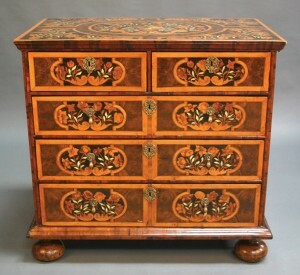 The sides and drawer fronts have similarly inlaid floral panels. Exotic woods, like olive and laburnum, reached this country via new East-West trade routes. The rare William and Mary longcase clock with its eight-day, five-pillar movement, striking on a bell, is by William Cattell of London. William Cattell was apprenticed in 1664/5 to Edward Stanton and was freed in April 1672. 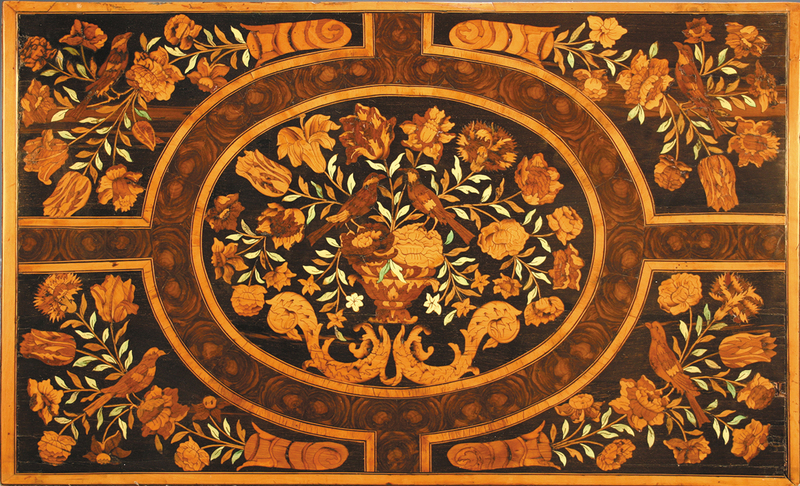 The walnut and laburnum oyster-veneered marquetry case is decorated with motifs of birds and flowers similar to those on the chest of drawers. The quality and richness of decoration, combined with the intimate and fine proportion of William and Mary furniture and clocks, continue to delight connoisseurs today and prices remain strong. Toovey’s next specialist auctions of clocks and furniture will be held on Thursday 17th and Friday 18th July 2014. If you are considering the sale of your clocks or furniture, please contact Toovey’s for free and confidential specialist advice. By Revd. Rupert Toovey. Originally published on 2nd July 2014 in the West Sussex Gazette.